Herbs are an important part of our diet – it doesn’t matter where you are in the world you will find herbs forming an integral part of culinary and medicinal traditions that are thousands of years old. 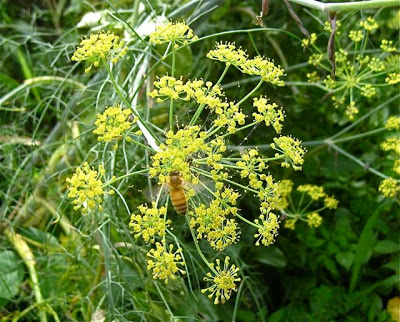 Herbs left to flower, like this dill plant are great attractors of insects and polinators. Apart from the enormous variety of flavours, they are incredibly good for you – a handful of fresh herbs added to a plate of food will often contain more vitamins and minerals than the whole dish. Think parsley and mint salads in Middle Eastern salads, coriander and basils in Asian dishes and oregano, basil, thyme and bay leaves in Mediterranean food – these are power packed with nutritional goodness. HERBS can be divided up into three different types ANNUALS, BIENNIALS and PERENNIALS. ANNUAL HERBS have to be planted every year and usually fall into the soft, leafy green variety – basil, coriander, dill and fennel. These are easy to grow in a well mulched bed. 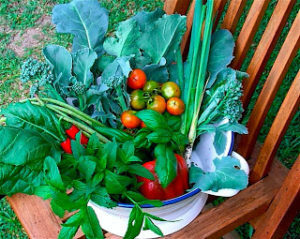 – just plant out seedlings in the springtime. BIENNIAL the lonely, but very important parsley. 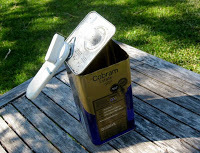 This takes two years to do its thing – grow leaves, flower, set-seed and die down. You can keep it going in the second year by pinching out the flowering stems as they appear. PERENNIAL HERBS persist from year to year. Some die down and then jump up again in the spring – like tarragon, yarrow, chives, comfrey and most the mint family. But some stay around for most of the year – they just look happier in the warmer months – like the thymes, oregano family, sage, lemon verbena, rosemary and bay. 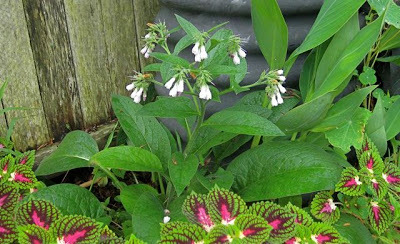 Flowering comfrey – where you need it – next to the compost bin! In the sub-tropics, this latter group of aromatic herbs are a bit more of a challenge for us to grow as many of them originate in the Mediterranean with particular soils and climate – that is a free-draining soil and dry summers – neither of which we have. For the first few years I lived here I would loose these plants every year in the summer wet. 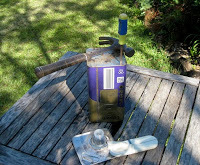 Now, I have just copied the ubiquitous Greek olive oil can garden and everything is thriving! Not only do I feel very virtuous about recycling these colourful cans, but I can move them under cover when we have a ‘big wet’. – and for the past three years they have been thriving. 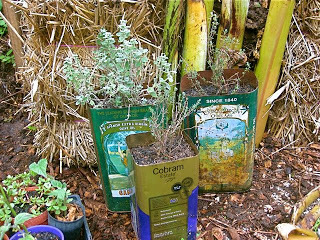 It was time today – being late winter – to divide up some of these plants in the oil cans as they had become just too crowded and root-bound. As I said to my neighbour today, unfortunately gardening is not like interior decorating – it is not finished even when the last wall has been painted! Actually, propagating is just about my favourite job to do in the garden – there’s something deeply satisfying about seeing new plants growing from seeds and cuttings. 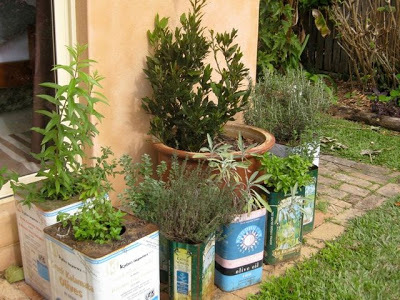 TOP TIP: The larger cans in the picture above are actual olive cans and make perfect planters – they are larger than the oil cans and already have a hole in the top, you just have to put some drainage holes in the bottom. Restaurants and cafes are usually happy to save these for you – especially in exchange for the odd potted up rosemary plant! Cut the top of the can with a can opener. The top will be VERY SHARP so this is not a job for the kiddies. WEAR GLOVES. 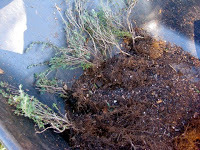 This is a thyme plant that easily divided up into about eight plants with roots attached to each. I re-planted two oil cans and put the rest into pots. 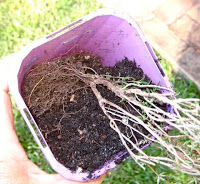 If you are planting rooted cuttings into pots it is easier to fill half the pot with potting mix and then lay the cutting on it’s side – then complete filling with potting mix. You may damage the roots if you try and force the plant into the pot of soil. My newly potted up thyme plants next to a lovely Greek oregano. TOP TIP: When moving a plant or dividing one up and you damage some of the roots – usually inevitable – prune off an equal proportion of the leaf part of the plant. For example, if you lose a third of the roots, take off a third of the top.